Being a catalyst for new ideas and concepts, IIFT undertook an academic initiative in 2008 to organise a Research Conference with an aim to provide a platform for academic debate, discourse and knowledge-sharing on different dimensions of Empirical Issues in International Trade and Finance (EIITF). The bi-annual EIITF Conferences are conducted alternatively in Delhi and Kolkata. Since inception, three EIITF conferences have been held so far. The First Conference was held in IIFT Kolkata in December 2008. The Second one was held in IIFT Delhi in December 2010 and subsequently, the third conference in IIFT Kolkata during January 2013. Academic discussions in the past three EIITF Conferences were greatly enriched by the presence of renowned academicians in differenced specializations of trade and finance like, Prof. Richard Baldwin (Graduate Institute, Geneva), Prof. Jeffrey H. Bergstrand (University of Notre Dame), Prof. Maitreesh Ghatak ( London School of Economics), Prof. Geeta Gopinath (Harvard University), Dr. Bernard Hoekman (World Bank), Prof. Kala M. Krishna (Pennsylvania State University), Dr. Will Martin (World Bank), Dr. Mia Mikic (UNESCAP), Dr. C. Rangarajan (Former RBI Governor and the then Chairman of the Prime Minister’s Economic Advisory Council), Prof. Partha Sen ( Delhi School of Economics) and Dr. Ganeshen Wignaraja (Asian Development Bank Institute). The fourth Conference will be held at IIFT Delhi Campus during 18th and 19th December, 2014 (Thursday and Friday). Please click here to view details of Invited Speakers. 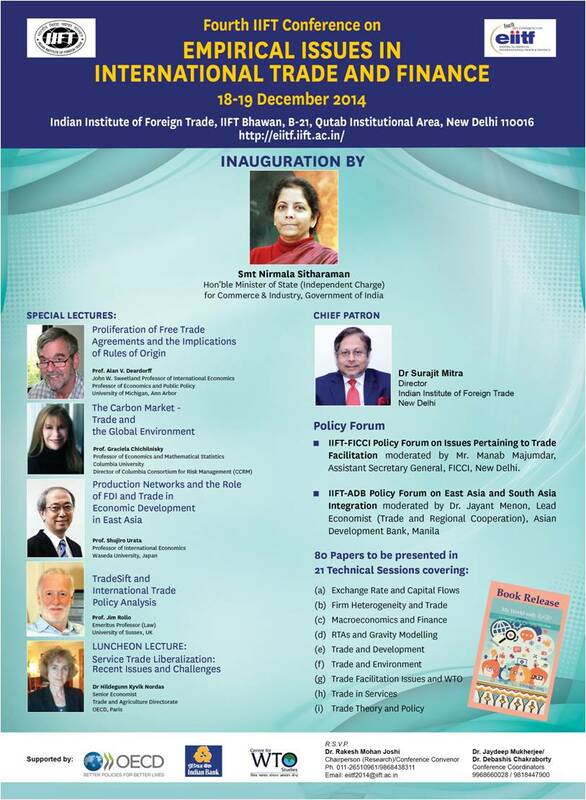 The Conference aims to have intellectual discourse on issues related to international trade and finance and provide platform to the researchers for communicating their views on their intellectual standing of empirical research in international economics. To encourage young researchers who are currently pursuing PhD in the area of international trade and finance a separate track is added in the Conference. The session is open for all doctoral students pursuing PhD in Indian universities ( or recently submitted their thesis but degree is awaited).